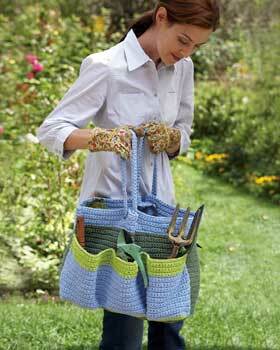 STITCH NATION® “Bamboo Ewe™”: 1 Ball each 5625 Sprout A and 5705 Snapdragon B. "...the summer is full of opportunities!" Crochet DROPS shorts in ”Safran”. Waist: 76-84-92-100-110 cm / 30"-33"-36 1/4"-39½"-43½"
Hips: 92-100-110-120-130 cm / 36 1/4"-39½"-43½"-47 1/4"-51½"
Full length: 32-33-36-38-41 cm / 12½"-13"-14 1/4"-15"-16 1/8"
200-250-250-300-300 g color no 06, denim blue. DROPS CROCHET HOOK size 3 mm / C – or size needed to get 26 sc x 28 rows = 10 x 10 cm / 4'' x 4''. 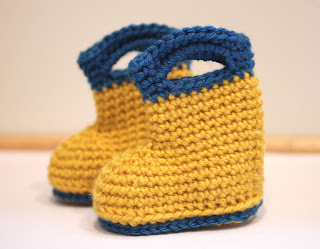 An adorable pattern for baby rain boots! 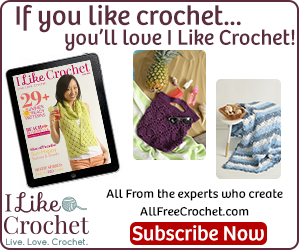 "It won’t take long to crochet this beautifully textured shawl in bulky fashion yarn. 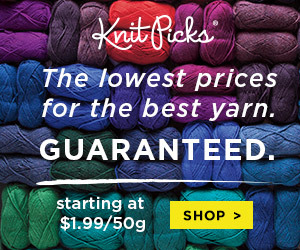 You’ll love the way the yarn automatically changes..."
RED HEART® Boutique™ Changes™: 1 ball each 9855 Aquamarine A, 9403 Granite B and 9675 Jade C.
Shawl measures 51” wide x 15” long, excluding fringe. 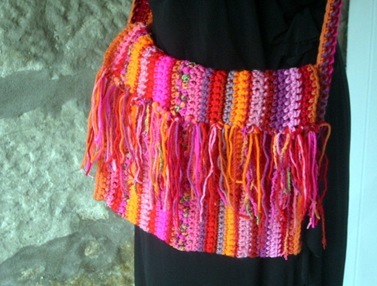 A Nice summery poncho or wrap to wear this summer! Looks great in different color combinnations as well! 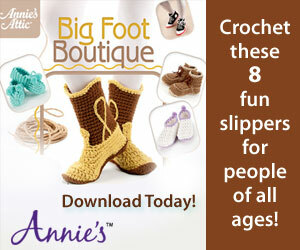 Sizes: Instructions contain guidelines adjustable to any size. 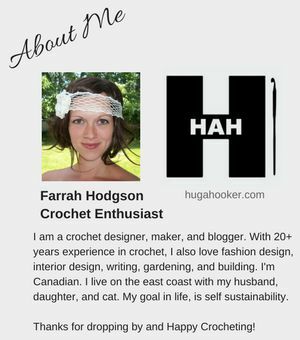 "I’ve been seeing this queen anne’s lace pattern on all sorts of pieces lately, scarfs mostly, some bookmarks as well as a headband. Then I saw this silver bracelet and fell in love! " 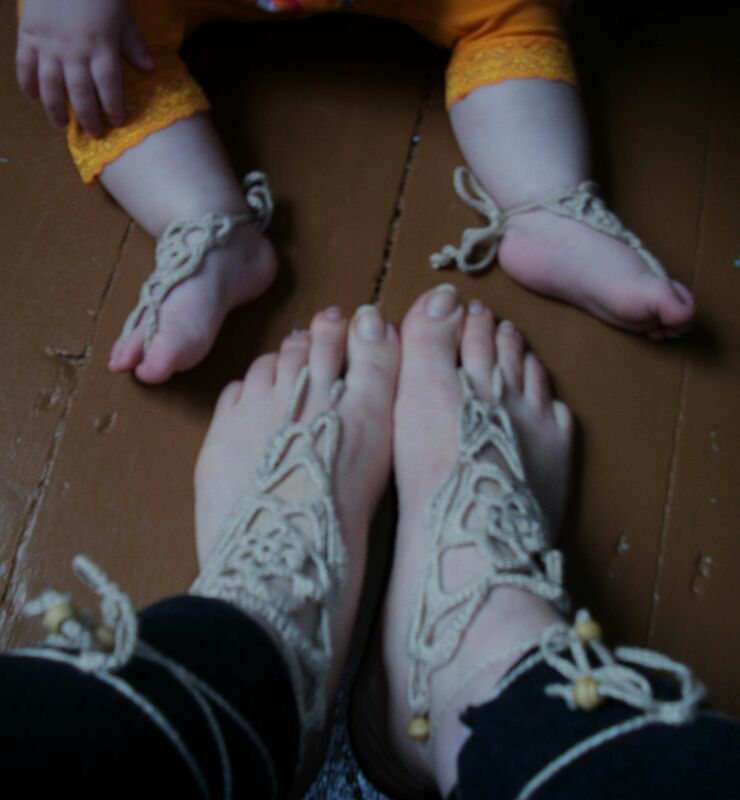 There's nothing sweeter than matching mommy and baby feet! Get the adult version here. Rnd 1: 12 sc in loop. Do not turn. 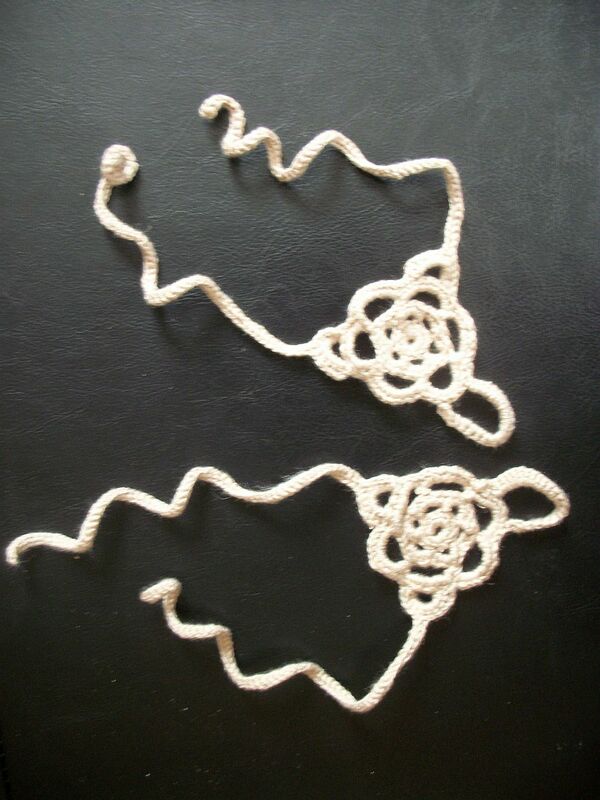 Rnd 2: Sl st in next st. *Ch 4, skip next st, sl st in next st* Repeat 6 times (6 petals made) Do not turn. Rnd 3: *5 sc in ch4 space. * Repeat 6 times. Do not turn. Rnd 4: Sl st in next 3 sts. *Ch 7, skip next 4 sts.Sl st in next st.* Repeat 6 times. Do not turn. Rnd 5: *9 sc in ch 7 space* Repeat 6 times. Do not turn. You are now working the sides with the ties. Rnd 1: Sl st in next 3 sts of prev row. Ch 6. Skip next 3 sts, sl st in next st. Turn. Rnd 2: 8 sc in ch 6 space. Sl st in corner between petals. Ch1. Turn. Rnd 3: Skip 1st st. Sl st in next 4 sts. Rnd 4: Ch 75. Sl st in 2nd ch from hook. Sl st in next 74 sts. Sl st in next 4 sts on petal tip. Sl st in corner. Fasten off! One tie is made. Now you are working the tie on the opposite side. Leave one petal between the sides. 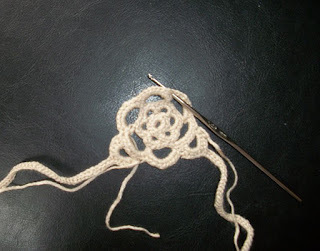 Attach yarn to bottom of next petal. See photo. 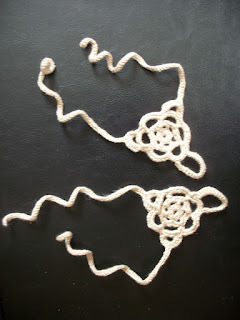 Repeat directions for the first side. 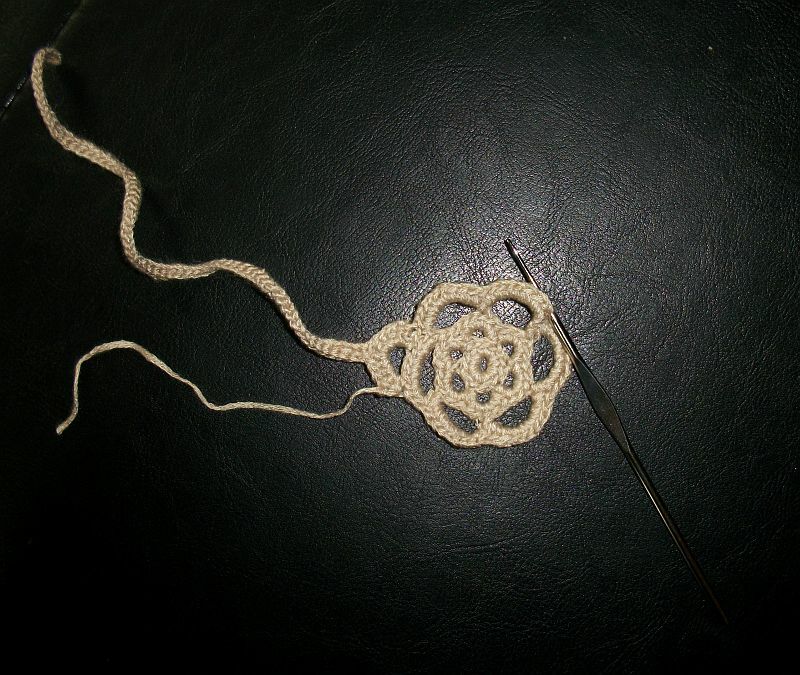 Attach yarn to side of bottom petal. See photo. Rnd 1: Sl st in next 3 sts. Ch 15, skip next 3 sts. Sl st in next st. Turn. Rnd 2: sc 20 inside ch 15 space. Sl st in next 3 sts. Fasten off. Sew in ends. Good luck keeping them on your baby's feet! I have to tie them in a knot for my little girl to keep them on! But she sure loves to play with them!